Height: 30-60'. 30' @ 30 years is common. Comments: Fast growing specimen conifer or screening hedge. 'Green Giant' is a vigorously growing, pyramidal evergreen with rich green color that remains outstanding throughout hardiness range. It has no serious pest or disease problems and has been widely grown and tested in commercial nursery production. 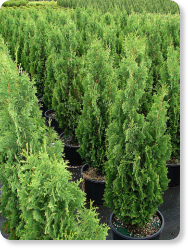 'Green Giant' is an excellent substitute for Leyland cypress. Adaptable, grows in soil types from sandy loams to heavy clays. Requires little to no pruning. Evergreen screen or specimen plant for parks or large landscape settings.